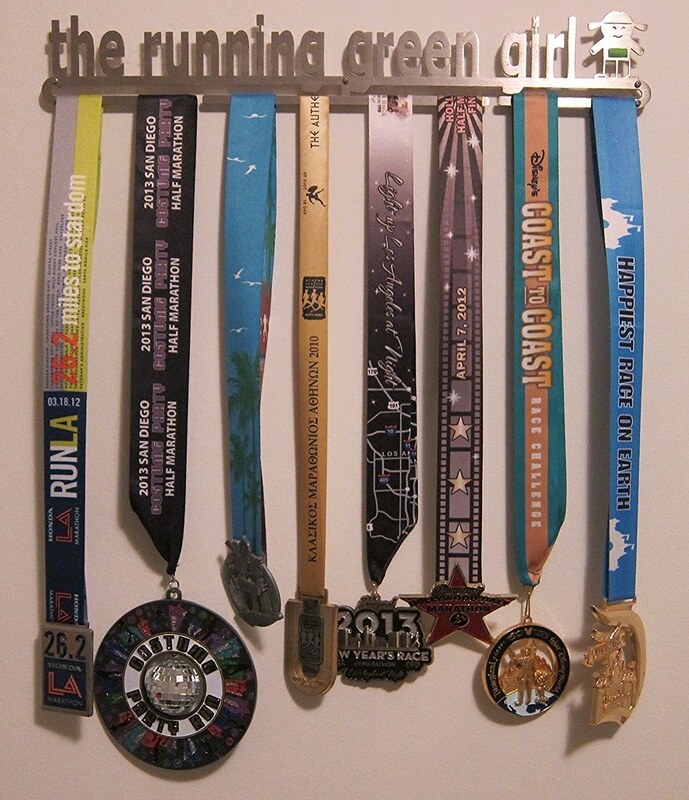 The Green Girl loves her Allied Medal Displays 'The Running Green Girl' medal holder. I won the medal holder a couple of years ago in Erin from See Mom Run Far's Big Fundraising Giveaway. The Allied Medal Displays are manufactured by a family-owned business, Allied Steel Fabricators. The company's motto is 'Old World Craftsmanship with Modern Day Style'. Allied Medal Displays offers a wide selection of running-themed medal displays in addition to other sports and hobbies. One of my favorites is their 'Run the USA' hanger. 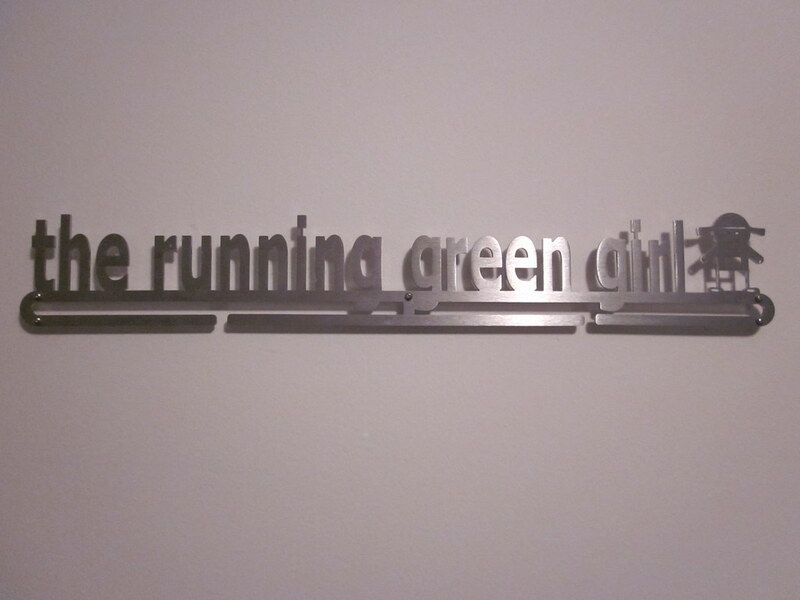 I worked with Joel Exe from Allied Medal Displays to create a customized 'The Running Green Girl' medal holder. Allied Medal Displays offers displays in 13", 18", 22", 26" or 30" widths. You also have the option to expand your medal display by adding rows. I didn't need a high capacity medal holder because I don't hold onto all my medals. I just keep the ones that I like the most so the single row hanger was adequate. I sent Joel a link to my blog, and he sent me an initial design concept that exceeded my expectations. I let him know I wanted the letters to all be lower case, I'd prefer a sans serif font, and asked if I could add a bib number to my mini me. He replied that my mini me was only 2" and it would be difficult to add that level of detail. Joel incorporated the changes I'd requested and sent back an updated proof. It was perfect. A week and a half later, I received an email from Joel letting me know they had my display cut, grained and ready to ship. My medal holder arrived in a long, slim box. I appreciated Allied's effort to minimize the shipping footprint. The medal display looked even better in person. My mini me was adorable. The steel medal display shipped with a hardware packet that included ¼” plastic nylon spacers that force the holder to sit off the wall by ¼”. This buffer protects the wall from the display and gives you the space to easily slide the medal ribbons on and off once the holder is mounted. I decided to center the medal display on my bare wall. I leveled and marked the wall with a pencil before I drilled the holes. 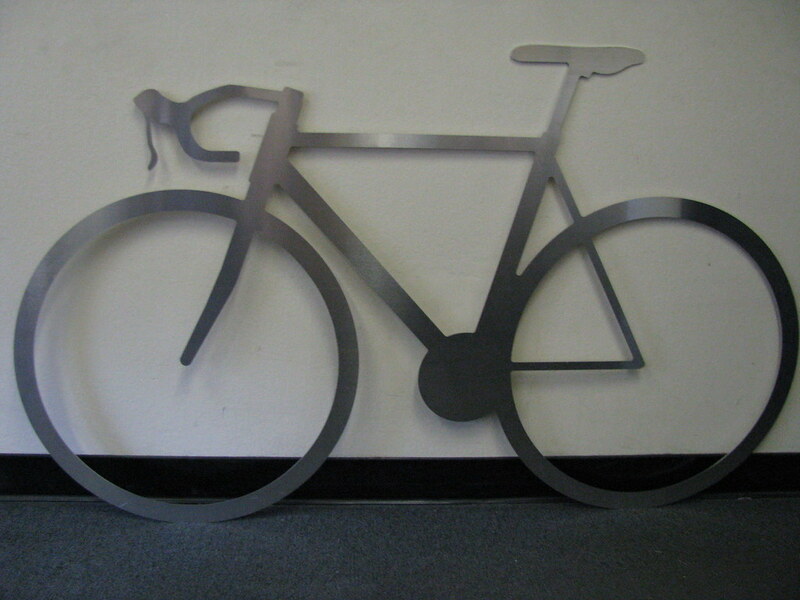 Once it was installed, I took a step back to admire my awesome new medal holder. I decided The Green Girl needed to be green so I snipped a piece of bright green shipping tape and stuck it on my 2" mini me's stomach. I absolutely love and adore my Allied Medal Display medal holder. I would recommend Allied Medal Display without hesitation. I was impressed by their exceptional customer service and attention to detail. Joel also demonstrated their commitment to continuous improvement when he asked me for feedback on the packaging and shipping. 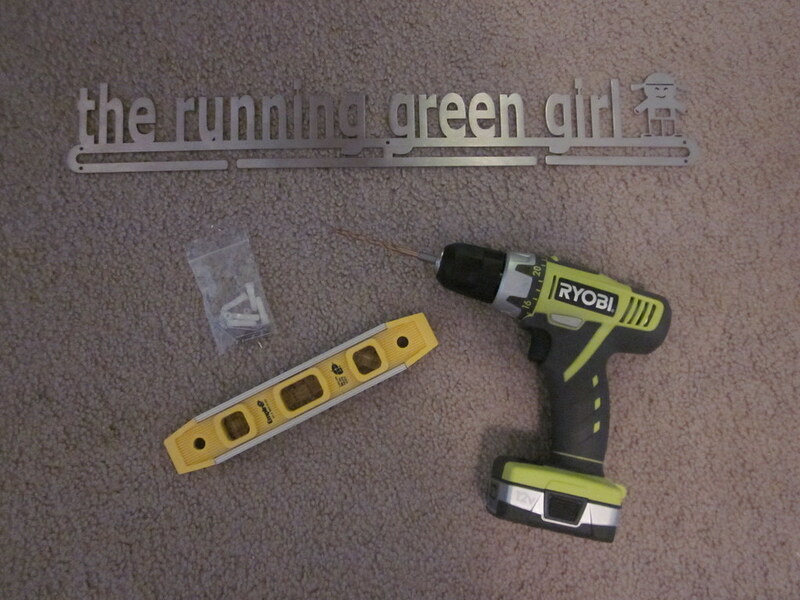 I'm one happy Green Girl with an awesome 'The Running Green Girl' medal holder. If you'd like to save 10% off an Allied Medals Display purchase, simply use discount code 'TRGG'. It is awesome!! I love it and am so glad you like it Your mini me is so cool!!! Thank you so much, girl! I love it! You have so many medals on your awesome holder, what will the sequel look like--"The Running Green Girl II"?!?!? Love it! You are too cute, girl. I know, I don't know what my next display will be - this one is just so perfect!